A very fast runner who was a good dribbler of the ball. Scored a hat-trick (some reports state that the second goal was scored by Goldthorpe) in Macclesfield's first ever entry into the FA Cup against Lockwood Brothers of Sheffield who won the match 4-3. Also appeared regularly on the score sheet in competitive matches and represented Cheshire at County level. When he had retired from playing tried his hand as a referee but after angering a section of the Chester crowd decided against this activity. Was appointed secretary of the club and also obtained a first class honours degree in silk manufacturing. Born in Fenton, first played for Stoke St Peter's and then Longton Hall. Given a one match trial by Macclesfield in February 1928 when he was introduced into the team along with four other new players in an attempt to stem a sequence of nine consecutive matches without a win. Unfortunately the experiment did not work as Macclesfield lost 1-7 on the day. Signed for Stoke City in May 1932 initially as an amateur but signed professional forms later in the year but only made three appearances. On leaving Stoke City he played for Millwall (May 1934) where he made 28 appearances, Wellington Town (summer 1936), Southport (June 1937) making 26 appearances, and Shrewsbury Town (summer 1938). Unfortunately he was killed in action during WW2 on 30 July 1944 at Caen, France at the age of 34. From Leek, this player was given a one match trial at a time when different players were filling the outside-right position. A member of the Wigan Academy from 2006 to 2008 and the youth section at Bolton Wanderers from 2008 to 2011, Jack signed his first professional contract with Bolton in August 2011. Although he made no senior appearances for Bolton, he spent time on loan at Southend United, where he made his Football League debut, and then Accrington Stanley in 2012. Jack moved to Morecambe in June 2013 where he had made 63 appearances and scored five goals at the time he signed a loan deal with Macclesfield Town in March 2015. Brought in to give manager John Askey an alternative option in the forward line at a time when the recognised forwards had not featured on the score sheet for several matches. Jack's two goals came in the 2-2 draw at Halifax at the beginning of April. During the 2015-16 season Jack featured in the majority of the matches in different roles: as sole striker in a 4-5-1 formation, in a double strike force in a 4-4-2 formation and for several matches on the left wing. Whilst only scoring four goals, all in the second half of the season, he brought other skills to his game by using his physical presence and held the ball up well. In the home match against Dover Athletic on 12 April 2016 when goalkeeper Richie Branagan was dismissed, Jack took over the gloves for the majority of the match keeping a clean sheet and was Man of the Match in recognition of his excellent performance. Involved in the majority of matches in the first half of the 2016-17 season Jack was used both as a striker and in a wide left midfield position and scored three goals. With manager John Askey preferring a sole striker (filled by Chris Holroyd) in his formation and other players available capable of filling the left midfield position, in January 2017 Jack went out on loan to Chorley until the end of the 2016-17 season. Released by Macclesfield in the summer of 2017 Jack signed for Southport. Made one appearance in 2011 for the England U19 side. Kevin commenced his career at Carlisle but then moved into the Non-League scene signing for Barrow in the summer of 1998, Telford Unted (1999-2001), Doncaster Rovers (July 2001-November 2002) and Halifax Town (November 2002-February 2004) before re-entering the Football League with Lincoln City in March 2004. Signing for the Silkmen in the summer of 2005, Kevin immediately went into the starting line-up, but after a rather uncertain time he was rested. However, when he was re-instated in November he returned a much more determined player and was virtually ever present for the remainder of the 2005-06 season at left-back or left wing-back. He took many of Macclesfield’s free-kicks from which he scored three goals and also netted two goals from open play, one of which, much to his delight as a left-footed player, was scored with his right foot. Having been transfer listed during the season, Kevin moved to Chester City in the summer of 2006. Subsequently he has played for Weymouth, Oxford United, Mansfield Town, Gainsborough Trinity and Buxton. Having been released by Buxton in March 2013 he played one match for AFC Wulfrunians after which he retired from playing football. In January 2018 Kevin, along with Jamie Haynes, were appointed as the new management team at Ellesmere Rangers (West Midlands League Premier Division). With Jamie Haynes leaving Ellesmere Rangers Kevin was appointed sole manager at the start of the 2018-19 season. Away from football is involved with Crossbar Coaching in and around Shrewsbury which has been established by Gavin Cowan (former Shrewsbury Town and AFC Telford United player) for the development of young people through sport across the curriculum as well as alternative sports. Neil was a trainee at Everton turning professional in May 1970 but failed to break into the senior side and having been released joined Torquay United in June 1991. He made 14 Football League appearances for them but was released at the end of the season when they were relegated to the former Division Three. He returned to the North West with Runcorn and then to Macclesfield where he was a member of the reserve side making just one senior appearance. He later played for Caernarfon Town, Bangor City, Chorley and Marine. In 1999, at the age of 26, Neil became the youngest licensed FIFA football agent. In 2005 he became the first agent ever outside the English Premier League to negotiate an Image Rights deal when Lee Trundle signed for Swansea City. The big, burly striker started his career at Queens Park Rangers in the youth section, moving to Leicester City in the summer of 2007 at the age of 18. He made just one substitute appearance for Leicester although he has been successful in their reserve side where he was a prolific scorer. In the 2008-09 season he had loan spells at Bournemouth, Oxford United and Telford AFC but only managed 14 appearances between the three clubs scoring three goals. He joined the Silkmen in August 2009 on loan, a move which was made permanent at the end of January 2010. His season was punctuated by injury, culminating in two knee operations which sidelined him for the remainder of the season. Nevertheless, he scored seven goals and, in a low scoring season, was joint top-scorer. Having recovered from injury Ricky made his first appearance of the 2010-11 season in December at Oxford when he scored a consolation goal. However, he failed to re-establish himself in the senior side and was released in the summer of 2011. Signed for Bishop's Stortford in 2012, moved to Billericay Town in the summer of 2013, Kingstonian in 2015 and VCD Athletic in 2016. Re-signed for Billericay Town for the 2016-17 season where he featured as a centre-half and then re-signed for Kingstonian in the summer of 2017. Moved to Heybridge Swifts on 26 October 2017, Cheshunt in January 2018 and Haringey Borough in December 2018. Represented Jamaica at Youth and Under-20 levels. Signed from Derby County, Sawyer featured throughout the 1895-96 season for Macclesfield but only played in the first match of the following season. Appears that he was used on both wings, scored on his debut in the 2-2 draw and scored two goals in the 4-1 home win against Buxton in February 1896. On leaving Macclesfield he signed for Stockport County in April 1896. He then moved to South Shore (October 1897 to May 1898), Newton Heath (October 1899), Chorley (August 1900), returning to Newton Heath (November 1900), Chesterfield Town (October 1901), Poolsbrook United (May 1902), Coventry City (September 1902), Kidderminster Harriers (November 1903), Foleshill Great Heath (April 1904), Walsall (September 1904) and returned to Foleshill Great Heath (March 1905 to April 1905). Was also a professional cricketer. Note: Is probably Thomas Okell Sawyer who died in the New Hall (then an old peoples residence) in Gawsworth on 17 February 1958. From Manchester, Schofield was one of numerous players given a one match trial in the 1919-20 season but was given another chance when he re-appeared in January 1926. He was unfortunate to be injured on his debut, and having recovered was only used to deputise for William Wainwright who had by then had established himself as the team's left-back. As there is no information recorded about this player other than he was from Ashton Town, it is assumed that he was being given a one match trial. From Openshaw, played in two league matches in September 1925. An amateur brought into a depleted side along with two other amateur players, but must have impressed as he remained a regular in the side for the remainder of the season. Moved to Macclesfield at the start of the 1950-51 season from Goslings after the club had gone out of business. A member of the reserve side whose introduction to the senior side came in the match against Bangor City on 28 October 1950 which was abandoned after 20 minutes due to fog. His official debut came the following week when he scored the first goal in the 3-2 victory. Born in Oldham first played for Hurst and then Glossop before signing for Oldham Athletic in August 1923 initially as an amateur but as a professional from October 1924. Signed for Walsall (June 1926) and then Mid-Rhondda United (September 1927). At Macclesfield for a single match when he was introduced into the side along with three other new players in an attempt to stem a losing sequence of matches. The change of personnel almost worked as Macclesfield only lost by one goal in five, with Scholes scoring the opening goal. Played for Hurst from 1929 to 1931 and then signed for Stalybridge, moving to Mossley in the summer of 1933 where he made 50 appearances and score 10 goals. After Mossley he signed for Accrington Stanley (August 1935), Ashton National (September 1935) and lastly Crompton Albion. Died on 7 September 1987 in Oldham. Andy joined the Silkmen straight from school and proved to be a very strong reserve team player who broke into the senior side in the 1974-75 season. Andy scored all six goals in the 6-0 victory over Droylsden in the Floodlight League. On leaving Macclesfield played for Nantwich but returned to Macclesfield for a second spell during the 1977-78 season. He then moved to Australia where he featured for Western Suburbs (April-August 1978), APAI Leichhardt (March-April 1979 and Sydney Olympic (April-September 1979). Also played for Winsford United during the 1984-85 season. Over the years, Andy has been a successful local retailer and was a director and Vice-chairman of the club until stepping down in May 2012. Brother of Andy, Rob captained Cheshire U18s team. He was a keen tackler and a constructive defender, who also moved up from the reserves. A £20,000 move from Sutton United to Sheffield United in the summer of 1993 was the start of Rob’s Football League career. He then moved to Fulham for a fee of £30,000 and Rotherham for a fee of £50,000, with loan spells at Scarborough, Northampton Town, and Carlisle United in between, before a transfer to Oldham Athletic in the summer of 2005, eventually joining the Silkmen at the end of August 2006. A tall, powerful centre back, Rob was a regular in the starting line-up for his first three months with the club, but for the remainder of the 2006-07 season he was only called upon when other defenders were unavailable, but still played a useful part especially making good use of his long throw-ins. Rob was released in the summer of 2007 when he signed for Halifax Town. He was then appointed manager at Ilkeston Town in the summer of 2008, and moved to Boston United in 2009 as joint manager with Paul Hurst. In 2011 they both moved to take up the joint managership at Grimsby Town but Rob Scott was dismissed in September 2013. Has been Business Development manager for Cannon Hygiene and is currently BBC Radio London 'colour'/co-commentator predominantly covering London teams when they are playing in the North of England. Has also been involved in education assisting in delivery of the FA Talent ID Level 2 Course. First played for Manchester Central. Signed by Macclesfield in October 1931 he took over the right-back position in November 1931 when Gibson retired to take up a full-time post with the Fire Brigade. He was almost ever-present throughout his time at the Moss Rose, winning Cheshire League Championship medals in the 1931-32 and 1932-33 seasons, in addition to a Challenge Cup winners' medal in the 1931-32 season. 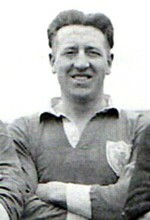 Was appointed Vice Captain in February 1933 when Joe McGrae left the club. On leaving Macclesfield he moved to Darlington (September 1933), then Stockport County (July 1935), Cardiff City (May 1936), and Wigan Athletic (May 1937). Started his career playing for Tudhoe United then Spennymoor United, Ferryhill Athletic, Willington Athletic, Crook Town, Scarborough and Bishop Auckland. Signed for Chilton Colliery (November 1923), Railway Athletic and then moved to Stockport County (March 1926), where he was partnered by Billy Johnston (see separate entry). On leaving Stockport signed for Peterborough (August 1928) and then Wigan Borough (May 1929). Moved to the Moss Rose in August 1930. With a good turn of speed and a powerful shot, he appeared regularly until the beginning of February 1931. On leaving Macclesfield signed for Crook Town in August 1931. Previously an amateur with Bradford, he was signed by Macclesfield at a time they had suffered a sequence of nine matches without a win. His debut was unfortunate as four other new players were introduced for the same match which they lost 1-7 with Scurrah scoring the Macclesfield goal. From the next match (at Eccles United) results improved with Scurrah scoring a hat-trick, after which he featured on the score sheet in four subsequent matches. On 9 April 1928, in the home match against Northwich Victoria, he sustained an injury which required surgery keeping sidelined for the remaining matches of the season. Although not a regular in the side, when given the opportunity he made the most of it regularly appearing on the score sheet. He scored a hat-trick in the 5-0 home win against Witton Albion in the middle of January 1958. As a teenager represented Bootle Schoolboys and on leaving school signed for Southport Reserves were he was ever present. In January 1972 he moved to Formby and made such an impression that despite his youth he was appointed captain in September 1972 going on to make a total of 54 league appearances scoring seven goals before he was spotted by Ron Yeates, manager of Tranmere Rovers for whom he signed professional forms in April 1973. He could not establish himself in the senior side only making one league appearance and asked for a transfer during his second season at the club which resulted in him spending two months on loan at Wigan Athletic. Roy Chapman, manager of Stafford Rangers, spotted him with Ben signing for Stafford in March 1974. In his first full season he was involved in their magnificent run of 12 matches in the FA Cup and gained a FA Trophy winners' medal in 1979. By the end of the 1979-80 season he had chalked up 334 league appearances and scored 49 goals but then moved on to Runcorn. Here he help the team achieve the treble in 1980-81 winning the NPL Championship, the NPL Cup and the NPL Shield. He was a member of the team which were champions of the Alliance Premier League at the first attempt in 1981-82 but their entry into the Football League was rejected due to ground regulations. Ben then signed for Macclesfield Town in the summer of 1982 where he was a tower of strength in the back line and scored two goals on two occasions: firstly, in the 4-3 away win at Gainsborough Trinity early in the season and, secondly in the 3-1 win in the Cheshire Senior Cup Semi-final against Witton Albion in 1983 and went on to gain a winners' medal in the final. For the 1983-84 season he returned to Southport playing 57 games and scoring two goals, being one of three players to make the most appearances that season. He briefly moved to Newtown before finishing his career in 1984 at South Liverpool. Born in Prestbury, Ian commenced his career at Bolton Wanderers in 1969, remaining there until 1973 making over 60 league appearances. He then spent three years at Chester making over 70 league appearances when he also had loan spells at Stockport County and Chesterfield. At Cambridge United for the 1976-77 season and Rochdale for the 1977-78 season, he joined Wigan Athletic in the summer of 1978 but only made one league appearance before signing for Macclesfield. He only spent a short time at the Moss Rose before joining Runcorn and then Stockport County, moving to Australia in 1979 to play for KB Newcastle United. He later moved to Hong Kong where he played for Bulova which would appear to be his last club. Having retired from playing Ian coached at Bolton Wanderers Academy for a period. Away from football Ian was a schoolboy cricketer in Bolton League and Bolton Association club cricket and more recently has worked in the buildings industry. Ian is a published author of Ah'm Telling' Thee, a biography of Tommy Banks of Bolton Wanderers and England. Wanting to complete his secondary education, Ben initially refused an apprenticeship at Barry Fry’s Birmingham City, but continued to play for their Youth team and made five appearances for England Schoolboys. Eventually he accepted an apprenticeship with Birmingham, although it was at Northampton Town whilst on loan that he made his Football League debut at the age of 19. Following a spell on loan at Mansfield Town, Ben moved to Peterborough in January 1996 and then to Mansfield in September 1996 from where he moved to the Silkmen for a fee of £25,000 in March 1998. In a way, Ben made his mark almost immediately, when he was most unfortunate to be dismissed for his alleged part in the infamous Lincoln match brawl. Despite always playing with enthusiasm, having a good turn of pace and adept at finding space, Ben found it difficult to command a regular place. However, in his final season at the club, he received his just rewards and was virtually ever present in his accustomed role as a right-sided central midfielder, and even took over in goal when Tony Bullock was dismissed at Southend. Always adopting an attacking stance, Ben scored some important goals, including one against Bolton in the Worthington Cup victory. Whilst at Macclesfield Ben gained a winners' medal in the Cheshire Senior Cup in 2000. Ben signed for Lincoln City in February 2001, later moving to the following clubs, Canvey Island, Cambridge United, Rushden & Diamonds, Havant and Waterlooville (on loan), Chelmsford City, King’s Lynn, Boston United and then Stamford AFC as assistant manager..
Ben was a member of the Management Committee of the Professional Footballers’ Association from February 1998 to August 2011. He has a Degree in Psychology and Law and a Masters in Finance, Marketing and Management. From April 2006 to July 2008 Ben held the post of Director of Sports and Events with Corporate Games and Events UK Limited moving to Sport for Life as Games Director and Head of Events from July 2008 to July 2010. There is some overlap in other appointments as he was Managing Director with Halcyon Redwood Limited from April 2007 to October 2017 and was Director/Trustee for Living Sport from November 2012 to May 2018. Ben was appointed Chief Executive officer and Head of Commercial Development and Events, World Corporate Games in July 2010, a position he held until moving to MM Flowers, based in Cambridgeshire, as Head of Commercial in May 2018. Appeared fairly regularly in the 1880-81 season but only in the opening matches of the 1882-83 season and, from information available, does not appear to have featured for the senior side in the 1881-82 season. A Curate at St George's Church he is said to have been a fine footballer confirmed in his first match for the club when he scored a hat-trick in the 6-0 home win against Cocknage. He also scored a brace against the Bolton side Eagley in January 1881. Alan was signed from Halifax Town and throughout the 1953-54 season shared the right-half position with Clifford Freer, although after only a couple of appearances the following season, his place was taken by Clifford Freer or Roger Kirkpatrick. Nevertheless, Alan was selected ahead of Freer for the Cheshire Senior Cup final in 1954 when he gained a winners' medal. Alan was described as a good tackler who played with tenacity. A member of the Macclesfield Community Sports Trust Football Education & Training Academy who played in the Cheshire Senior Cup first round match. 16 year-old Joel is a defender who can also play as a midfielder. Whilst at Macclesfield he read the game well and looked to play football whenever possible. Signed for Maine Road at the start of the 2015-16 season and was selected in the North West Counties team of the year for 2015-16. Moved to FC United of Manchester in the summer of 2017 where he went on to make 68 appearances and was awarded the Manager's Player of the Year Trophy for the 2017-18 season. Moved to Curzon Ashton in February 2019. A member of the Macclesfield reserve team for whom he regularly appeared at left-half. He was used in the senior team to deputise for players who were unavailable featuring at right-half for the majority of these appearances. His one cup match came in the second round of the Cheshire Senior Cup on 22 January 1927 in the 3-1 win at Hyde United. A Scotsman who played in three early season matches possible on trial. Previously with Manchester Central, Harry signed for Macclesfield in the summer of 1931 and played for the senior side for one season when he featured in 46 of the 51 matches. He won a Cheshire League Champions medal and gained a winners' medal in the Challenge Cup competition. On leaving Macclesfield he moved to Rochdale (August 1932), then Ashton National (July 1933) and finally Manchester North End (September 1934). There is no information recorded about this player but as he made just one appearance in the penultimate match of the season. In line with the common practice of using late season matches to give players a one match trial, it is most probable that he was being given a trial. Chris was released by Wigan Athletic after over 50 appearances to become manager Sammy McIlroy’s first signing for the Silkmen. He started his football career in North Wales with Bangor City and then Caernarfon before moving to Stalybridge. He spent just one season at the Moss Rose transferring to Altrincham. One of several players called upon towards the end of the season when the club were clearing a backlog of matches. There is no recorded information about this player. Having played for Congleton Town, featured in the opening two matches of the season and in the reserve side during a month's trial after which he was released. Described as a new player from Stoke, he scored two goals on his debut in the 2-3 defeat at Sale Holmfield, but was not selected for the next match, a second round Cheshire Senior Cup match a fortnight later. In his second match on 23 January 1904, he scored the winning goal in the 2-1 home win against Stretford and featured again a week later in the 0-4 home defeat against Denton. This appearance was reported as his last for Macclesfield following a disappointing performance. There is no information recorded about this player who featured towards the end of the 1902-03 season. Nigel had been with Stoke City and then Newcastle Town but was signed from Congleton. He was an energetic midfield player who was voted Player of the Year for the 1985-86 season and at the end of the same season he had heroically deputised in goal for the injured Alan Zelem for several matches after the transfer deadline. Nigel was one of four players involved in a serious car crash at the start of the 1986-87 season when he sustained a broken arm which kept him out of contention until October, but played his part in the final months of the 1986-87 triple winning season (NPL Championship, League Cup and Presidents Cup) when he was ever-present. Also, Nigel only missed one match in the Silkmen’s first season in the Conference. On leaving the Silkmen he joined Altrincham and then played for Runcorn, Winsford United, Altrincham, for a second time, Stalybridge Celtic, Nuneaton Borough, Leek Town and Knypersley Victoria. An electrician by trade. Signed from Winsford United, Sam played with lots of enthusiasm and featured regularly from September onwards, although he only managed seven consecutive appearances. Dave brought a wealth of league experience to the Moss Rose having played for Manchester City where he made 42 appearances in the First and Second Divisions, Stockport County (58 appearances) and Halifax Town (120 appearances). He held one England U23 cap. After his time at Macclesfield Dave retired from playing football. Died in November 2015 at the age of 74. A member of Macclesfield's reserve team. Macclesfield's reserve team goalkeeper at the time, made his one senior appearance when Macclesfield fielded a weakened side for this FA Cup match which they lost 0-5, giving priority to The Combination away league match against Everton Reserves on the same day in which first choice keeper Kent appeared. There is no information recorded for this player who featured in the first season of the newly formed Macclesfield FC in their pre-league days. Both his appearances came in consecutive matches, his debut coming in the 28th minute when he replaced John Timmons. The 18-year-old played on the right side of midfield, with his debut being described as noteworthy, almost scoring a goal but his shot was cleared off the line. Macclesfield paid a fee of £6,000 to Hyde United for George who was a highly rated and tenacious defender. He was one of the first YTS players at Manchester City in 1983 and later played for Bolton Wanderers and Preston North End. A knee injury kept him out of contention for much of the 1989-90 season. George suffered a horrific injury when a tackle left him with one of his legs broken in seven places during the fourth qualifying round of the FA Cup in October 1994 against Bishop Auckland at the Moss Rose. Subsequently, George won a civil court action against the Bishop Auckland Club. Although George made a full recovery, he never played for Macclesfield again and moved to Altrincham when his contract expired having made 199 appearances in all competitions for the Silkmen. During his time at the Moss Rose George gained winners' medals in the Cheshire Senior Cup in 1991 and 1992 and a winners' medal in the Conference League Cup in 1994. On leaving Altrincham George moved to Chorley and then Ashton United. Lives in the Manchester area and runs his own property development business. Moved from Goslings when the team folded to become a member of the formidable half-back (centre-back) line with Freer and Richardson. Was an England Amateur International, played against Wales (at Bangor) and Ireland (at Belfast), also represented Middlesex Wanderers against Holland (at Amsterdam and Rotterdam), and featured in the Cheshire League team. At club level he gained three Cheshire Senior Cup winners' medals in 1951, 1952 and 1954, and was a member of the team which were Cheshire League champions in 1952. It is reported that he unusually played in his glasses. Played for Hanley Y.M.C.A. before joining Port Vale in May 1929 where he only established himself in the senior side at right-half in April 1932 going on to make 48 Football League appearances and scoring three goals before losing his place in March 1933. Transferred to Colwyn Bay in July 1933. Moved to Macclesfield, initially on trial, in December 1933 playing regularly at right-full back until early April 1934. Previously on the books of Coventry City, Liverpool and New Mills, Mike moved to the Moss Rose from Altrincham at a time when he was highly regarded goalkeeper in the NPL taking the gloves over from Robin Simpson, and was ever-present in the 1979-80 season. Moved to Mossley very early in the 1980-81 season but returned to the Moss Rose from Mossley for the 1983-84 season when he only missed 10 matches, Peter Eales covering for him. Dave was also a NPL XI representative. After spending a short time on loan at Oswestry Town, Mike played for Witton Albion and Congleton Town. A former Universities player away from football he was a schoolteacher. A former England under-21 international and a vastly experienced striker, Mike started his career at Manchester City after which he moved to Norwich City, Stoke City, Queens Park Rangers and Barnsley who collectively paid transfer fees amounting to £5.2m. These moves were followed by a free transfer to Blackpool with Mike joining the Silkmen just two days before the start of the 2004-05 season on a free transfer. At the Moss Rose he was a regular member of the side in the first half of the season, usually in a three-man attack, however, with Jon Parkin in such fine form partnered by Matthew Tipton, the manager reverted to a two-man attack leaving Mike with few opportunities such that he moved to Shrewsbury Town in March 2005. From there he joined Warrington Town as a player and shortly after retired from playing football becoming a member of the coaching staff at Warrington. Subsequently was the youth team manager at Bury from 2007-10, spent a year at Oldham Athletic (2010-11) as the Under 15s coach, a short time coaching at Bath University (2011) then moved to Liverpool's Academy (2011-13) where he was coach to the Under 13s. He then became Head of Academy at Rotherham United (2013-15) before his appointment at Blackburn Rovers in March 2015 initially as Lead Youth Development Coach and Under 16s manager and subsequently Professional Development Phase Assistant Coach. Prior to joining the Silkmen Alan was at Knypersley Victoria and then Stoke City. Popular with the supporters, he gained promotion to the senior side from the reserves following some excellent displays which brought him much praise. Before joining the Silkmen Jack had played for Whitchurch, Stoke City (1927-28) and Wellington Town (summer 1930). Signed for Macclesfield in the summer of 1931, Jack was a clever and industrious player who was almost ever-present in his first season scoring two hat-tricks in his 25 goals. In the 1932-33 season he lost his place for a time to William Black, but when Black left the club Jack was re-instated. He also scored six goals in the match against the Rest of the League which the Silkmen won 8-5. Won a Cheshire League Championship medal in seasons 1931-32 and 1932-33 as well as gaining a winners' medal in the Challenge Cup competition. On leaving Macclesfield he moved to Nelson. An amateur playing with Central Old School Boys who was drafted in with two other amateurs for an end of season match, when three senior players were unavailable through injury. Prior to his short spell on loan with the Silkmen, Chris had spent the majority of the 2000-01 season playing for Manchester City reserves where he had made some fine performances. He was loaned by Manchester City so that he could gain first-team experience, and it was with Macclesfield that he made his senior debut and later scored his first senior goal, a fine header in the 1 – 0 win against Kidderminster Harriers. A tricky and speedy left-winger who was not afraid to tackle, Chris went on to make a handful of appearances for Manchester City and then had loan spells at Walsall, Rochdale and Hartlepool United before moving to Barnsley. Chris has since played for Tranmere Rovers and Morecambe, signing for Port Vale in December 2011. Joined the coaching staff of Tranmere Rovers under manager Micky Adams in October 2014 and also made three senior appearances during the 2014-15 season. With a change of league status and manager at Tranmere, Chris was released at the end of the 2014-15 season when he retired from playing football. Embarked on a managerial career as assistant manager at Trafford FC but was released at the beginning of October 2017. Is currently (December 2017) a personal trainer at Body pro Fitness and is also Head Football Coach at Carmel Sixth Form College. Barry was a trainee at Bury where he earned his first professional contract in July 1995, but did not progress to the senior side and moved to Rotherham in the summer of 1997 where he made his senior debut, and then moved to Blackpool a year later where he made 23 appearances before signing for Scarborough during the summer of 2000. Signed non-contract forms with Macclesfield in October 2001. A left-sided defender who could push forward, Barry was very much a fringe player in the senior side, nevertheless, he appeared regularly for the reserves in their Avon Division Two championship season. After leaving Macclesfield Barry moved to Altrincham, joined Accrington Stanley in 2002 returning to Altrincham in December 2002 and after being released in October 2004 he signed for Bamber Bridge. Later played for Clitheroe (October 2007), Ramsbottom United (2009) and Padiham (2011). A local lad, Tony joined the Silkmen having been an outstanding schoolboy footballer. He was a member of the reserve side called into the senior side from time to time, and scored his one senior goal on his debut in the 4-1 victory. George hailed from Dundee and was a strong tackler, yet he had a heart of gold and was a great favourite with the fans. He commenced his football career at the junior club of Broughty Ferry Athletic from where Dundee United signed him in 1957. He then moved to Oldham Athletic (1963, fee £500), Tranmere Rovers (1964), Rochdale (1965) before signing for Macclesfield in the summer of 1966. Was a member of the Northern Premier League championship sides in 1968-69 and 1969-70, holder of a FA Trophy winners' medal in 1970, two winners' medals in the Cheshire Senior Cup in 1969 and 1971 and was a member of the team which won the North West Floodlit League in 1969-70..
On leaving Macclesfield he joined Mossley as player/manager and later as manager at Stalybridge. He spent 20 years as area manager for Philips Lighting and then became a self-employed lighting distributor, at the same time being a part-time scout for Emley. Ray started his career at Bedford Town FC coming through the youth team there, leaving in 1974 to play for Milton Keynes City. It would appear that Ray moved north at some stage as he signed for the Silkmen from Horwich RMI. He was a tall, strong and experienced defender whose appearances all came in the early part of the season. He also played for an FA XI, for Chorley and coached at Leigh RMI leaving them in November 1973. An amateur from Stoke who was given a one match trial when Burrows, the established right-back at that time, was out injured. With the regular keeper Jack Hacking sidelined, amateur Simmons was pressed into action just after the start of the season until the beginning of October and was on the winning side for half his matches. On leaving Macclesfield he moved to Mossley during the 1955-56 season where he turned out for them as a defender. There is no information recorded about this player who played in the first two matches of the season at a time when the club appeared to be seeking a player to fill the centre-half position as several different players were used until Standfast was given the role in December 1913. Previously with Port Vale and Winsford United. Made three consecutive appearances deputising for Donald Triner, but did not feature again despite scoring on his debut in the 2-0 win and again in the 2-1 victory over Congleton Town in the Challenge Cup. Started at Whitfield Colliery before signing for Stoke City Reserves (March 1934) as an amateur and then Leek Alexandra, Port Vale (October 1926), Swansea Town (May 1932) and Winsford United (August 1932). Signed for Macclesfield in October 1932 when he replaced Davidson and retained the position until he was injured, missing the final two months of the season. Billy Owen was signed in March 1933 to fill the outside-left position. Signed for Northwich Victoria in June 1934 moving to Stafford Rangers in September 1934. Prior to World War One Frank was on the books of Leeds United. In the War he served in the Royal Garrison Artillery and played in their team at left-half when stationed at Gosport. He was later part of the British Expeditionary Forces overseas. On his return to England he signed for Leeds United (November 1920) and then Crewe Alexandra (May 1921) playing in their Third Division (North) side at centre-half. When Perry signed for Crewe at the beginning of the 1921-22 season, Frank moved to the Reserve team. Signing for Macclesfield in the summer of 1922 Frank spent one season at the Moss Rose when he was almost ever-present. A player of sound judgement, a great tackler, a good distributor of the ball and with good aerial ability he served the club well. On leaving Macclesfield he signed for Whitchurch at the beginning of the 1923-24 season staying with them until April 1924 when he signed for New Mills. He moved to Hurst for the 1925-26 season. Away from football, his occupation was a County Clerk and he was a cricket enthusiast. Started his career as a midfielder at Stoke City where he made over 100 appearances for the reserve team. However, the rest of his playing career came at non-league level. First at Boston United (1980-85), then Stafford Rangers (1985-86), Weymouth (1986-87), Stafford Rangers (1986-87), Boston United (1988-90), Altrincham (1989-91), Gainsborough (player/manager 1991-93), Arnold Town (1993-94) and Hyde United (1994-95). He won nine England semi-professional caps and also captained the Middlesex Wanderers touring side playing games in Indonesia, Holland and Hungary. On retiring from playing, Simpson teamed up with Keith Alexander, who he first met when they were both players at Boston United, acting as assistant at Ilkeston Town (1996-2000), Northwich Victoria (2000-01), Lincoln City (2002-06) and Peterborough United (2006-07). In May 2007, when Keith Alexander was appointed Director of Football at Bury, Simpson joined the club as a coach with responsibility for the reserve side and scouting. On 27 February 2013 Simpson returned to Lincoln City as manager but in November 2014, having spent time on gardening leave, he was dismissed. During the 2015-16 season he was appointed assistant manager at Barrow. As Gary is no longer listed as a member of the management team at Barrow, whilst there has been no official announcement it is assumed that he has left the employment of the club. 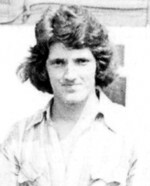 Gordon played for the Silkmen reserves in the 1975-76 season, but left for Ashton United. He also had a spell with Wigan Athletic before returning to the Moss Rose for second spell, making appearances in the senior side. Signed by Mossley in April 1984 from Congleton Town and was released by Mossley in May 1985. Playing in the Liverpool League, he was unfortunate to be given a run out with Macclesfield in their heavy 0-6 defeat at Chester. A former Stockport junior and England schoolboy international, Robin progressed through the Silkmen reserve side to take over as first team ‘keeper from Nigel Lownds. His ability and height, he was 6’ 3” tall, earned him respect from opposing attackers. Having played for New Mills (fee £100), he joined for a second spell in 1980 taking the gloves from Kevin Rafferty and, other than for the first two months of the 1981-82 was first choice ‘keeper maintaining a sequence of eight consecutive clean sheets. During his time with the Silkmen he had trials with Nottingham Forest. His grandfather played for Macclesfield in the 1920s. He then played for Stalybridge Celtic (twice), Congleton Town, Witton Albion (twice), Leek Town (making over 90 appearances), Chorley and Hyde United. Robin was an ink salesman to the newspaper trade. Featured in five matches in place of Stanley Holt. Emile started his career at Nottingham Forest where he made 18 appearances. Loan spells at Brentford and Mansfield followed before moving to the Moss Rose in January 2009 where he spent a total of three months on loan. Emile made a flying start when he scored on his home debut in the win against promotion contenders Brentford but, despite his pace and agility, he was unable to add any further goals. His move was made permanent in the summer of 2009 and whilst most of his appearances were as a striker, from time to time he covered a wide midfield role where he made many speedy runs. He scored seven goals and completed the season as joint top-scorer. Emile continued to use his pace to good effect at the start of the 2010-11 Season but was side-lined through injury in October/November. On recovering he appeared regularly scoring five goals in the season, two which came in the 3-2 defeat at Burton in March 2011. Taking up the centre-forward role at the beginning of the 2011-12 season following the departure of Tyrone Barnett, Emile was in fine form and scored three goals in the Carling Cup competition. A move to Championship club Peterborough United came on transfer deadline day at the end of August 2011 for an undisclosed fee. Spent time on loan at Barnsley (2012) and Doncaster Rovers (2013). Signed for Crawley Town in August 2013 for a fee of £100,000, spending the second half of the 2013-14 season on loan at Northampton Town, signing permanently for them in the summer of 2014. Having been released by Northampton Town in January 2015 he signed for York City and spent time on loan at Guiseley before signing for Altrincham in the summer of 2016. Having made only four appearances for Altrincham Emile moved to Bradford Park Avenue in September 2016. Signed for Scarborough Athletic in the summer of 2017 but left them early in October 2017, shortly after signing for Ossett Town and moving on again in January 2018 to Goole AFC. Started the 2018-19 season at Athersley Recreation moving to Liversedge in December 2018. Emile is cousin of Micah Richards. A member of the reserve side in both the 1926-27 and 1927-28 seasons. After his senior debut in April 1927 he then made three consecutive senior appearances in September 1927 at a time when there was no one specific player allocated to the right-half position. Collin started his career at Poulton Victoria in the West Cheshire League before moving to Formby and then Cammell Laird. A midfielder who could also play up front, he attracted league scouts with his ability and goal scoring knack. Collin scored two goals in the 3-2 home win against Runcorn in the NPL match in November 1978. On leaving Macclesfield played for New Mills, Stalybridge Celtic (twice), Witton Albion, Hyde United (fee £450), Rhyl and Ellesmere Port & Neston. A young reserve team player whose appearances came at the end of September and the beginning of October 1968. There is no information recorded for this player who featured during the first two seasons of the newly formed Macclesfield FC in their pre-league days. Appeared on the scene during December 1901 filling the outside-left position for the remainder of the campaign. Featured regularly for the Macclesfield reserve team at outside-left making one senior appearance when the regular outside-left, Forrest, was unavailable. A natural footballer, conscientious and is reported to have worked hard to improve his game, but was unable to force his way into the senior side. Although born in Barnsley joined Bolton Wanderers on leaving school making his debut against Manchester City in September 1961. Having only made a handful of appearances he was advise that there was no long term future for him and was released in 1963. He signed for Cheshire league side Wigan Athletic where he made 16 league appearances scoring four goals. He then left for Australia signing for Sydney Prague where he won representative honours and was then invited to represent the Australian National team making two appearances in the World Cup qualifiers against North Korea and Cambodia. Returned to England in 1967 when he made his sole appearance for Macclesfield Town in April 1967. Went onto play for Stalybridge Celtic, Buxton and Mossley in 1974 going on to make 148 appearances and scoring 10 goals in his three years at the club. In November 1976 he was appointed caretaker manager for six matches but Howard Wilkinson was appointed manager. Moved to Droylsden for the 1977-78 season but returned to Mossley in 1978 to make two appearances. Was then appointed manager at Frickley Athletic guiding them to promotion to the Football Conference in 1980. He later was appointed manager at Goole Town. Re-united with Howard Wilkinson when he was appointed chief scout at Leeds United, a position he held from 1993 to 1996. A young player from Denton given a one match trial. A Welsh amateur who commenced his career as a youth with Llanerch Celts before joining Wrexham as an amateur in September 1933 moving to Chester in September 1934 where he signed professional forms, however, he was unable to establish himself in the senior sides at either Wrexham or Chester. Signed for Macclesfield in the summer of 1935. Described as a speedy player with a powerful shot, Freddy was a prolific scorer completing the 1935-36 season as second top-scorer behind Oswald Jones with a total of 35 Goals. He netted a hat-trick in the early season 3-2 win at Crewe and scored two goals in each of nine other matches. He also scored Macclesfield's goal in the 1-2 defeat by Runcorn in the Cheshire Senior Cup. In the 1935-36 season he was the only player who appeared in every single match. On leaving Macclesfield Freddy moved to Southampton in the Football League Second Division playing in all but one match in the 1936-37 season. Injured in pre-season to the 1937-38 season, he lost his place and only featured in eight matches and at the end of the season refused a new contract. Notched up 48 league appearances and scored 10 goals during his time at Southampton. Signed for Reading (January 1938) in the Football League Third Division South remaining there until the start of the second World War making 43 league appearances and scoring 12 goals. Freddy retired from professional football during the war but went on to make guest appearances for Wrexham, Newcastle United, Sunderland and Hartlepool United. It is reported that he was a superstitious player carrying a lucky rabbit's foot in the pocket of his shorts on match days. He settled in the Sunderland area after the war where he played in a small dance band. Died in Durham on 1 December 1965 at the age of 55. Having progressed through the ranks at the Moss Rose, Andrew was awarded his first professional contract in the summer of 2005. He was only used occasionally in his first season at senior level usually at left-back, however, he featured once as an emergency striker, with his sole senior goal coming from a 22-yard strike in the first leg of the Northern Area Final of the Football League Trophy at Carlisle. In his second season, Andrew did not feature at all but spent two months on loan at Northwich Victoria and was released in the summer of 2007. Since then Andrew has played for Stalybridge Celtic (2007-10), Hyde United (2010-11), Trafford FC (2011-12), Altrincham (March 2012), Trafford FC for a second time (2012-13), Salford City (summer 2014) but returned yet again to Trafford FC (September 2014), Glossop North End (September 2015) and Ramsbottom United (February 2016). A member of the reserve team who filled in at senior level from time to time. Born in Congleton he first played for Congleton Excelsior before signing for Macclesfield during the 1904-05 season featuring regularly in the team for the remainder of the season. His appearances in the following season were limited, last appearing in November 1905. It is unknown where he played between November 1905 and the beginning of the 1907-08 season, but he signed for Burnley remaining there until 1910 making 60 league appearances scoring four goals. He then moved to Blackburn Rovers where he only made three senior league appearances during the 1910-11 season after which he moved to Southport Central. A member of Macclesfield's reserve team for many years, this player was used as a reliable deputy for other players. A young player from Chadderton given a one match trial in the second match of the season. Made just the one senior appearance. There is nothing recorded about this player. An able deputy to the regular goalkeeper J Morton in each of his three seasons with the club, often on the winning side. A professional footballer since the age of 17, Alex initially signed on a month’s loan in September 1953 at the age of 25. The previous season he was playing for Weymouth and before that had been on the books of Hibernian and St Mirren. He impressed during his initial month's loan and went on to play in the majority of matches in each of the three seasons he was at the Moss Rose. Alex usually occupied the left-back position, but in the 1953-54 season he filled in at right-back when J Alan Jones was unavailable. He gained a Cheshire Senior Cup winners' medal in 1954. Previously with Worksop and Stockport County, Smith only featured in early season matches scoring on his third appearance in the 1-4 defeat at Sandbach Ramblers. Brother of Cecil Smith, he took over the goalkeeper's position when Harold Compston was injured. He was on the winning side for seven of his 17 appearances and lost his place when Stanley Starling was signed at the end of December 1930 who then became the first choice 'keeper. Born in Marchwiel, Wales Cecil commenced his football career in the Principality playing for Marchweil FC, Oswestry Town (summer 1924), Welshpool Town and Wrexham (October 1925) before moving to Wigan Borough (July 1928) where he made 38 senior league appearances scoring 23 goals and then Notts County (August 1930). He signed for Macclesfield in the summer of 1930 along with his goalkeeper brother. In his sole season with the Silkmen he was top-scorer in all competitions, netting almost half the team's goals and scored five hat-tricks along the way, and only missed two matches throughout the season. On leaving Macclesfield he spent the 1931-32 season with Stalybridge Celtic before signing for Burnley (June 1932) where, in four years, he made 106 senior league appearances scoring 49 goals. In the 1936-37 season he played for Cardiff City before signing again for Stalybridge (May 1937) and completed his career back in Wales with Rhyl (February 1928) and then Bangor City (summer 1939). A member of the Macclesfield Youth Team. His one appearance came in the Cheshire Senior Cup when the youth team were fielded for the round two tie. Released at the end of the 2012-13 season. David is a former Norwich City trainee and England under-21 international who was awarded his first professional contract at Carrow Road in 1989. He then spent five years at Oxford United before moving to Stockport County, and joined the Silkmen on loan in February 2002 as cover for the injured Kevin Keen, when he impressed in the midfield with his precise passing. Having been released by County he moved to Eircom League side Droheda United before eventually linking up with the Silkmen on a permanent basis in January 2001. Unfortunately, over the following 18 months, David was limited to only a few appearances as he was dogged by injury and was released in the summer of 2004, subsequently retiring as a professional footballer. David set up his own high class chauffeur business in Liverpool taking agents, footballers and celebrities to various events. The third goalkeeper used during the 1901-02 season, he took over from T Lloyd after a run of defeats. First choice 'keeper for the 1902-03 season but was replaced by Rowbotham from the middle of January 1903 to the end of the season. Again first choice 'keeper for the 1903-04 season until 30 January 1904 when he refused to travel for the next match at Hooley Hill at a time when the team had failed to win a match since the third week in November 1903. Replaced by reserve team 'keeper Frost for one match, with former 'keeper Walter Brocklehurst playing until 16 April 1904 when Smith returned. Only featured on five occasions during the 1904-05 season after Humphries had moved to Stretford pending the appointment of John Wilkinson. A native of Buxton he first played for Buxton Villa at inside-left and then Buxton Wednesdays as a full-back before moving to their Saturday team where he was their goalkeeper at a time when three Smith brothers were playing for Buxton. In 1906 he signed for Stockport County where he remained for three seasons, making 27 Football League appearances. Moved to Derby County in May 1909 where he reverted to the full-back position making five senior Football League appearances. Signed for Macclesfield in August 1910 when he was partnered by Frank Johnson and Percy Pickford. In his time from 1910 to 1913 Fred missed very few matches and in the 1910-11 season he played his part in the team winning the Manchester League Championship and the Cheshire Senior Cup. In May 1913 he was recruited by Southern Football League side Southampton at the veteran stage of his career. He initially played for their reserve team where he was appointed captain, but was promoted to the senior team at the beginning of November making 11 consecutive appearances and a further five towards the end of the season. At the end of the 1914-15 season he was struggling to regain full fitness and decided to retire and moved back to Macclesfield to concentrate on his motor business career. As a member of the Territorial Army, he was mobilised at the start of World War One in August 1914 with the Derbyshire Yeomanry as a motor cycle dispatch rider. He saw service in France, Egypt, Gallipoli, Macedonia, Italy and Sardinia and was captain of the regimental team. Demobilised at the beginning of 1919 he returned to Buxton becoming a member of a team called Buxton Comrades of the Great War winning the Derbyshire Cup. He then spent time with Maidstone United (June 1919). He returned to Macclesfield in August 1920 where he featured regularly at right-back, was the team's designated penalty taker and captain from January 1921 to March 1921. His season came to an abrupt end when he was unfortunate to break a leg in the semi-final of the Cheshire Senior Cup against Congleton on 19 March 1921, and it was not until 30 December 1922 that he returned to the side when it was reported that he made a surprising and welcome return. He made three further appearances including one in the final match of the season at left-half by which time he had become the team's assistant trainer. Fred was always recognised as a reliable defender and was always cool and methodical at all times. He ended his career at Buxton Wanderers as an amateur having obtained permission to change from the status of professional. During his football career he had won medals in the Cheshire Senior Cup competition, Manchester League (see above) and the Kent Senior Shield. After he retired from playing he was the steward at the North Western Sports Club. Fred died, aged 70, on 23 December 1957 at Macclesfield. His youth career took him to Brentford, Chelsea and Gillingham before dropping into the Non-League scene when he signed for Sevenoaks Town for the 2013-14 season. Next he signed for Sittingbourne in July 2014 remaining there until December 2015 but during the first half of the 2014-15 season he featured for Tunbridge Wells. On leaving Sittingbourne he moved to Folkestone Invicta where he netted 13 times in 19 league appearances gaining trials at Aberdeen, Gillingham and Millwall before signing a two year contract with Millwall in August 2016. Made his debut on 8 November 2016 scoring twice in the EFL trophy match against Luton Town and went on to make 12 appearances, scoring six goals in all competitions. In July 2017 he signed a season-long loan with Swindon Town but although he made 19 appearances and scored three goals his loan was terminated towards the end of December 2017. Returning to Millwall he spent time away from the game in early 2018 to receive help for mental health and addiction issues and was released by them at the end of the 2017-18 season. There is no information recorded about this player who was signed on 16 April 1920 and was brought in at a time when the club had to fulfill two Subsidiary League fixtures on the same day. A former England Schoolboy who played at centre-forward and as a youth played for Dewsbury Moor Welfare and then Whitehall Printers. He signed professionally for Huddersfield Town in the summer of 1932 (45 league appearances, 24 goals) moving to Newcastle United in September 1934 where he was top scorer on three occasions making 112 league appearances scoring 73 goals. He then moved to Manchester United in September 1938 (30 league appearances scoring 12 goals) remaining with them throughout the Second World War. During the war he scored 150 goals, none of which are counted towards the official total as all matches played during the war were designated as 'friendlies'. During the war he also found time to guest for Burnley and Blackburn Rovers. Leaving Manchester United he signed for Port Vale in May 1947 remaining there for one season making 29 league appearances and scored 10 goals, although he missed four months with a pulled stomach muscle. At the end of the 1947-48 season he refused new terms and signed for Congleton Town. Signed for Macclesfield in the summer of 1949. Most of his appearances for the Silkmen were made in the 1950-51 season when he was top-scorer with 33 goals, scoring two hat-tricks on the way with his goals helping the team to reach (and win) the Challenge Cup final although he unfortunately missed playing in the final. As a player he was a member of the team who won the Cheshire Senior Cup in 1951 and became manager in October 1951 leading the side to the Cheshire League Title in the 1952-53 season. He left the club in November 1955 and was manager at Hyde United for the 1957-58 season. Jack died on 21 April 1975 aged 60. Jeff was a trainee at Hartlepool United but moved into the non-League scene and worked as a postman until Sam Allardyce signed him for Bolton Wanderers. A two month loan spell with the Silkmen gave Jeff a taste of first team football when he made good use of his pace, pressed forward regularly and made some useful crosses. He scored his first senior goal whilst with us, which came from a somewhat fortunate free-kick in the home win against Leyton Orient, and went on to show that he had an eye for goal scoring a late equaliser in the match against Halifax at the Moss Rose. Jeff returned to Bolton, and then spent time on loan at Scunthorpe United, Rochdale and Preston North End, before moving to Port Vale in the summer of 2004 and then Carlisle United who paid a fee of £60,000 for him in January 2007, and later moved to Darlington. He then spent a season with Belgium Third Division B club, ROC. De Charleroi-Marchienne before returning to England in 2011 signing for Whitby moving to Celtic Nation in the summer of 2012, leaving them at an unknown date. A young defender who came from the Stockport area and had played for Belmont School Club and St Paul's Sunday School. He had also represented the JOC League at the age of 15. Discovered in local Saturday League football. His debut lasted just five minutes, with his single start coming in the 1-1 draw at King's Lynn at the end of April. First played for Alsager College before joining Nantwich Town in September 1980. He moved to Leek Town in November 1981 and Port Vale in August 1984 for whom he made 13 league appearances. Martin signed for Macclesfield in the summer of 1995 featuring regularly until February 1986 when he lost his place following the dismissal of manager Neil Griffiths. He then played for Eastwood Hanley before returning to Leek Town where he later became assistant manager. In the 1989-90 season at Leek Town was their leading scorer and Players' Player of the Year. Away from football was a media representative. A former Cheltenham trainee, who also has experience of playing football in America for Arizona State University during his studies there, has spent some time playing for a number of non-League clubs including New Mills, Stourport Swifts, Redditch North, Littleton FC, Droylsden and Solihull Moors where he notched up 12 goals in 14 appearances attracting the interest of Football League clubs. He opted to sign for Oldham Athletic for whom he featured regularly duing the 2011-12 season, mainly from the bench. Matt signed on loan for Macclesfield in March 2012 to the end of the season, and featured regularly until he was recalled by Oldham immediately after the Silkmen's penultimate match. Matt's one goal came in Brian Horton's first match in charge at Rotherham, when he headed home a Matt Hamshaw corner. Signed for Leeds United in the summer of 2013 and then Fulham in September 2014, spending time on loan at Bristol City during the 2014-15 season. He moved to Queens Park Rangers on 31 January 2017 signing a three and a half year deal. Matt's father, Ian, was also a professional footballer for Queen's Park and Hearts in Scotland and then Birmingham City. Joined the newly formed Macclesfield Under 21 Youth Development team at the start of the 2017-18 season. Featured in the only Cheshire Senior Cup match of the season when members of the Development team were used to fulfill this tie. Peter gained International Honours for England at Schoolboy and Youth levels, and having progressed through the ranks at Crewe Alexandra he was awarded his first professional contract in the summer of 1996. He spent three months on loan at Macclesfield from September 1998 in a bid to boost the team’s woeful strike rate, and certainly helped by scoring a great goal at Preston North End as well as bending the ball inside the post against Burnley. On his return to Crewe, he could not break into the senior side on a regular basis and was released by them in the summer of 2001 when he joined Telford United where he remained for two years. On the books as an amateur for Stockport County, Stoke City and Chesterton PSA, Stan's first professional contract came at Port Vale in 1950 where he made 63 appearances in all competitions and scored 21 goals. He then moved to Crewe Alexandra for the 1957-58 season, and Oldham Athletic (fee £250), however, after only four appearances he left them as he did not want to become a full-time professional. He moved to Witton Albion in 1958 where he scored 60 goals in 92 appearances. He then joined the Silkmen in 1960 where he became a prolific scorer. He scored twice on his debut and, in his first season, went on to net 38 league goals including seven hat-tricks as the season's top-scorer. Stan was also top-scorer in the following two seasons scoring 32 goals in 1961-62 and 24 goals in 1962-63. On leaving the Silkmen he moved to Stafford Rangers, then Runcorn and New Brighton. He was player/manager at Winsford United and managed Alsager Town. At a later date he was involved in Match Day Hospitality at Port Vale. During his time at the Moss Rose he was employed as a planning engineer for English Electric. Died: Stoke-on-Trent in April 2010 aged 79. Started his career at Boldon Colliery before signing for Stockport County initially as an amateur in July 1934, turning professional in September 1935. Signed by Macclesfield in the summer of 1936, Smith was one of only two players in the 1936-37 season who was ever-present. Also played in Macclesfield's 1939-40 war-time team. Before signing for Macclesfield Alan had been a member of the reserve side at Halifax Town where he had also made one senior appearance for the Shaymen. Alan was an entusiastic player in the Macclesfield reserve side and was brought in at senior level as occasional cover. His senior debut came after playing only two mtches in the reserve side. On leaving the Silkmen he played for Congleton Town, Knutsford (twice) and Witton Albion. Born in Birmingham, Eric joined Preston North End at the age of 15 and featured in their senior team from 1972 to 1974 making 20 league appearances. He then made the move to Crewe Alexandra staying there for one season, 1974-75, when he made 34 appearances after which he moved to Southport where from 1975 to 1978 (Southport's last three seasons in the Football League) he made 110 league appearances and scored two goals. Next stop was Rochdale, where he made 183 league appearances and scored one goal between 1978 and 1983. Having picked up an injury he was released by manager Jimmy Greenhoff and signed for Bolton Wanderers but only made six first team appearances during the 1983-84 season. He then signed for Macclesfield where he made eight consecutive appearances in place of Neil Fairclough and a further two in December 1984 and January 1985 before moving to Barrow from September to October 1985, then Leyland Motors, Formby (Summer 1988 to November 1988), and one game for Morecambe in November 1989. Works on the railways and has appeared for Preston North End Legends in charity matches. Much travelled brother of Efe Sodje signed on loan for Macclesfield Town from Tranmere Rovers in February 2014. First played for Gold Star in Nigeria but commenced his UK career at Queens Park Rangers in 2001, although he made no appearances for them but made his senior debut whilst on loan at Stevenage. On his release from QPR he signed for Hayes before moving to Margate in September 2001 after which there were a succession of moves - Gravesend & Northfleet (2002), Heybridge Swifts (2002), Erith & Belvedere (2003), Huddersfield Town (2004), including a spell on loan at Darlington, for whom he signed in 2005. He then signed for Port Vale in the summer of 2006 making over 50 appearances in all competitions, moving to Sheffield Wednesday in the summer of 2007, and had two spells on loan at Charlton Athletic for whom he signed permanently in the summer of 2010. He left Charlton in January 2011 moving to Hibernian remaining there for twelve months, before signing a contract in March 2012 with Chinese Super League side Tianjin Teda leaving them on 1 July 2012. Since returning to the UK he has played for Preston North End (2012), Scunthorpe United (2013) before signing for Tranmere Rovers in the summer of 2013. Spent a month on loan at Macclesfield in February/March 2014 making five appearances before returning to Tranmere Rovers who released him in April 2014 after which he retired from playing football. Born in Greenwich, Efe moved to Nigeria with his parents at the age of eight. His career started with non-League side Invisible Leopards and later he was offered a contract with the professional side Steele Pioneers. In 1994 he returned to England when he had trials with Luton Town, Millwall and Wimbledon, but signed for Conference side Stevenage Borough in October 1994 where he won a Conference Championship medal. He signed for Macclesfield in the summer of 1997 for a fee of £30,000, a record at the time, with the level of the fee set by a Tribunal as the clubs could not agree a figure. A tall, distinctive central defender, who wears a bandana, emblazoned with the words ‘against all odds’ at the request of his mother who believes it will bring him luck, he soon hit the headlines by scoring Macclesfield’s first league goal. A great turn of pace and tenacious tackling served the Silkmen well and his desire to get forward for set pieces gave him the opportunity to score goals. Efe was always a firm favourite with the fans. He was a member of the team who gained promotion from Nationwide League Division 3 as runners-up in 1997-98 and gained a winners' medal in the Cheshire Senior Cup in 1998. Since leaving Macclesfield in the summer of 1999, he has represented Nigeria on twelve occasions and has played for Luton Town, Colchester United, Crewe Alexandra, Huddersfield Town, Yeovil Town, Southend United, Gillingham and Bury where he was player/coach. With the appointment of a new manager at Bury, Efe was signed on loan at Barrow in February 2013. Efe returned to Macclesfield in the summer of 2013 as player/assistant manager. Pre-season Efe fractured the fifth metacarpal in his hand from which he recovered in time to feature towards the end of August. However, following a knee injury in September Efe's playing appearances were restricted to the Cheshire Senior Cup competition allowing him to concentrate on his responsibilities as assistant to manager John Askey. Behind the scenes Efe was involved in commercial activity helping the club out during a difficult financial time. An official announcement in June 2016 by the club stated that Sodje had left the employment of the club. At a Tribunal Hearing completed on 8 February 2017, which had been brought by Sodje, it was recorded that he was suspended by the club on 29 October 2015 and dismissed on 14 March 2016. It concluded that he had been unfairly dismissed and awarded him compensation in that he had been wrongfully dismissed in breach of contract. Together with his brothers Efe set up the Sodje Sports Foundation however, funds raised at events were paid into the accounts of the Sodje brothers rather than the Foundation. A trial at the Old Bailey in London in 2017 found Efe guilty and was he sentenced to 18 months in prison. Currently (season 2018-19) Efe is a member of the Academy staff at Morecambe. Started his career at Warrington Town moving to Leek Town in August 1995. Portsmouth paid Leek Town a fee of £30,000 for Steve in 1998 from where he was loaned to the Silkmen in March 1999 to make up a depleted squad, and played in ten of the final 11 matches of the season. He moved to Carlisle United in the summer of 1999 for a fee of £30,000 where he made almost 200 appearances scoring 19 goals, and having been released by them in the summer of 2002 he signed for non-League Southport. Having been signed from Crewe Alexandra in August 1992, Neil played an integral part in the centre of midfield for the Silkmen’s Conference campaigns including the 1995 and 1997 Championship winning seasons, the FA trophy victory in 1996, was voted onto the Vauxhall Conference team of the season 1996/1997. Also gained winners' medals for the Conference League Cup in 1994 and in the Staffordshire Senior Cup in the same year. A member of the team which completed the 1997-98 season as runners-up in the Nationwide League Division 3 gaining promotion to the Nationwide League Division 2. Neil played an important part in the Silkmen’s first two seasons in the Football League, belying his quiet unassuming nature off the field with a strong performance on the field including a high work rate, tough tackling, good distribution and an eye for goal. Gained a winners'medal in the Cheshire Senior Cup in 1998. On leaving the Silkmen in the summer of 1999 he joined Crewe Alexandra where he proved himself at a higher level over a six year period under the watchful eye of Dario Grady making almost 300 appearances. Since leaving Crewe Neil has played for Shrewsbury, Morecambe (under Sammy McIlroy), Droylsden and Northwich Victoria. Having retired from playing football Neil is a PE teacher and has been involved with the Mid-Cheshire College Football Development programme. Spent time as assistant manager at Nantwich Town FC but when manager Phil Parkinson left Nantwich Town in May 2017 to take up the appointment as manager at Altrincham he took Neil along with him to be his assistant. Bill commenced his playing career as a member of the youth team at Greenwood Victoria before signing for Manchester City (1952-53, 11 league appearances and four goals) where he was one of the first players to own a car and gave supporters a lift to matches, and even gave the referee a lift on one occasion. He claimed that he was the first City player to score under floodlights. Leaving City he moved to Chesterfield in 1954, where he was extremely successful making 97 league appearances scoring 59 goals in three years. Moved to Stockport County in 1957 where he scored eight goals in 16 appearances in all competitions, signing for Macclesfield in the summer of 1958. During his time at Macclesfield he used his style of immaculate footwork and opportunism to good effect earning him the nickname of ‘Poacher Sowden’. Top scorer with 19 goals in the 1958-59 season, Bill scored three hat-tricks during his time at the Moss Rose, with his best performance coming in the 6-1 home friendly match against Wigan Athletic when he scored four goals. Bill played his last match for Macclesfield on 5 November 1960 moving to Altrincham where he made eight appearances during the remainder of the 1960-61 season. On retiring he took over the family bakery business and moved to Heaton Chapel. Bill died at the age of 79 in November 2010. Moved to the Moss Rose from Portsmouth. Ken appeared regularly for the Silkmen, but it was only in the 1949-50 season that he was almost ever-present. In February 1949 he was placed on the transfer list by the directors but his popularity with the supporters saw him quickly removed. The home match against Wrexham in November 1949 was styled Ken Speak’s ‘day out’ as he had got married in the morning, played for the Silkmen in the afternoon before travelling to Blackpool for his honeymoon. He celebrated by scoring a goal in the Silkmen’s 3-1 victory. His ability was recognised when he was selected for the Cheshire League side and he gained a Challenge Cup winners' medal in 1948. Signed again in January 1954 when he only featured on three occasions. Prior to joining Macclesfield had played for Chester, Stockport County and Buxton. Only missed six matches throughout the whole of the season, making 22 consecutive appearances in the second half of the season. Son of Joe Spence who played for Manchester United. There is no information recorded about this player who was probably given a two match trail for a position which Lingard had made his own. Previously played for Runcorn and Sandbach Ramblers, Harry was given a three match trial during a time when the team were in a middle of a sequence of matches without a win. A member of the Macclesfield reserve team given his first taste of senior football in the Challenge Cup when he made a favourable impression. He played in the next league match and in two league matches in the 1926-27 season scoring a penalty in the 5-1 home victory against Whitchurch on 3 January 1927. Scott’s career started at Oldham Athletic where he scored 20 goals for their Academy. Everton are reputed to have paid £200,000 for him in 2006 although he never made a first team appearance for them. In the 2007-08 season he spent time on loan at Yeovil Town where he scored three goals in his three outings for their reserve side and joined the Silkmen on loan in March but only made three appearances from the substitutes’ bench. He went on to play for Rochdale, Southend United, Lincoln City, Hyde United, where he spent a short time on loan at Halifax Town, signing for Stockport County in the summer of 2014. Returned to Hyde during the summer of 2015 and re-signed for Stockport County in the summer of 2016. In October 2016 he moved to Stalybridge Celtic but left them at the end of December 2016 after which Scott retired from playing football. Represented England at Under-19 level and in the England C team. Commenced his career with Newcastle PSA before signing for Newcastle Town in September 1910. Moved to Leek United in February 1912 and Brighton in June 1913. Signed for Macclesfield in August 1914 and replaced Harry Lappin in November 1914 when he left the club. Spooner was ever-present to the end of the season. Later played for Port Vale. On the books of Nantwich, Crewe Alexandra (September 1929) and Sandbach Ramblers before his move to Macclesfield. Signed for Macclesfield in October 1934, he was an occasional player who filled in when other senior players were unavailable. He gained a Cheshire Senior Cup winners' medal in 1935 when he played in place of the injured Jimmy Naylor. There is no information recorded about this player whose only appearance came in the 0-3 defeat against Northwich Victoria in the first match of the season. Played for Eastwood Hanley, Hednesford Town and Telford, where he had a good scoring record. Signed for Macclesfield from Northwich Victoria only remaining with the club for a single season. Later played for Leek Town from the middle of the 1980's to at least the end of the 1989-90 season. Away from football was a civil engineer. A young player who had made an impression in the Poynton area given the opportunity to feature in the Macclesfield senior side. His goal came in the narrow 3-4 defeat at Hurst in October 1927. Goalkeeper Phil was one of Stockport County's first ever apprentices at the age of 15 under Reg Flewin but never made it into County's first team. He had a spell with Hyde United playing in the same team as Ricky Hatton's dad, Ray. As a player he was also on the books of Blackpool and Crewe Alexandra before playing for Non-League teams Buxton, New Mills and Nantwich Town. He moved into management at Non-League level with Welsh League side Bethesda where his team put 14 goals past a young Neville Southall (who was named Man of the Match) and Ashton United. He joined Macclesfield Town in October 1978 from Chorley where he had been coach. The Board gave him the rest of the 1978-79 season to rebuild the team and transfers were fast and furious with no fewer than 51 different players making a first team appearance, however, the Silkmen completed the season in bottom position of the Northern Premier League. The 1979-80 season saw a more settled Macclesfield side which finished eighth in the league but the Northern Premier League was a much weakened unit than previous seasons with the loss of seven teams to the newly formed Alliance Premier League. After disappointing early season results, including losing 2-6 to Stourbridge in the first qualifying round of the FA Cup, Phil was dismissed in September 1980. Is the author of the book Get those sheep off the pitch - a Life in Non-League Football in which he recalls many amusing incidents including his shortest managerial stint, less than 48 hours at Droylsden without even stepping foot in the ground. He has been a scout for Dario Gradi at Crewe Alexandra and later became a match summariser for Signal Cheshire before he moved to the ill-fated ITV Digital. More recently he has been assistant manager at Nantwich Town but after only a month in the post had to resign due to ill health, and was appointed Head of Player Recruitment at Colwyn Bay in May 2015. Also still helps out with live match commentaries. In 2018 as part of the 50th Anniversary celebrations of the formation of the Northern Premier League (now the Evo-Stik League) a vote was held to find the top 100 NPL players in which Phil was in 99th position. Recruited in the middle of the 1913-14 season to fill the centre-half position which until then had been covered by four different players. Results which had been inconsistent soon started to improve and he became an important part of the team which attained promotion from the Second Division. Standfast missed the start of the 1914-15 season but from October onwards he featured regularly until the end of the season after which Macclesfield did not field a team again until the 1919-20 season.. Played for Altrincham in the War time league in 1917-18 and again for them in 1919-20 and a single game in 1921-22. First played for Eccles Borough signing for them in August 1907. In May 1910 he joined the Manchester United reserve team moving to Rochdale in December 1911. Stanford signed for Macclesfield in September 1912 moving from Eccles Borough, He spent a single season with Macclesfield, scoring a goal in every three matches including a double strike in the 2-1 away win at Tranmere Rovers in the first round of the Cheshire Senior Cup. Although he was recognised as a hard working player he moved Glossop in August 1913, returning to Eccles Borough in October 1914. Played junior football with Stockport Grammar School and Greek Street Baptists (Stockport Sunday School league) before joining Altrincham in the summer of 1926 at the age of 18 where he was a prolific scorer and was picked to represent Cheshire amateurs. Then signed for Oldham Athletic in May 1927 scoring five goals in the first six matches for their reserve side. Signed by Macclesfield in the summer of 1929 Clifford scored 32 goals in a high scoring season by the team when he was the fourth highest scorer. Had a fair turn of speed with the ability to beat an opponent on the run. Amongst his achievements were two hat-tricks, a Cheshire Senior Cup winners' medal and was selected for the Cheshire League against the Welsh League in March 1930. On leaving Macclesfield he returned to Oldham in May 1930 and played five matches at outside-right but could not establish himself and was released in April 1931. Died 7 October 1970 in Holywell. There is no information recorded for this player who was probably playing on a trial basis. A member of the Macclesfield reserve team in 1903-04 where he played at inside-left, featured for the senior side in a defensive position for two matches. Commenced his career at Chester playing at right-back. He then moved to Burnley initially playing at right-back, but after a successful trial as a goalkeeper he moved to that position which he maintained for the remainder of his career. On leaving Burnley he signed for Stoke City and then he returned to Chester on this occasion as a professional player. After a short time at Connah's Quay Stanley signed for Macclesfield towards the end of December 1930 taking over as the first choice 'keeper from AH Smith. He remained 'keeper until February 1932 when Richard Williams was signed and only missed playing in two matches during his time at the Moss Rose. Featured in a single game for Altrincham during the 1933-34 season. Joined Macclesfield during the summer of 1909 from Fegg Hayes and went straight into the team playing in place of Percy Pickford. In the away match at Witton Albion in the middle of November 1909, the Macclesfield goalkeeper Burbidge was taken ill during the second half and had to leave the field with Steadman taking his place in goal. Pickford had re-appeared during October but missed a few matches between then and the end of December with Steadman and Johnson standing in. Steadman's last match was on Christmas Day 1909 against Hooley Hill at the Moss Rose when he was injured. He did not appear for the club again. Reported as a local player, he was given a one match trial towards the end of the season. A member of the reserve team Frederick made a single senior appearance when he replaced the regular outside-right Donald Triner who was, at the time, injured. Frederick also represented England Schoolboys and played whilst serving in the RAF alongside Stanley Matthews. He was a fitter at Michelin in Stoke-on-Trent. Was a schoolboy in Leicester City’s Academy before moving to Oadby City leaving them in November 2015 to join Kettering Town, later moving to Stratford Town where he made 72 appearances scoring 27 goals. In January 2018 he had trials at Coventry City and Ipswich Town. His performances at Stratford in the 2017-18 season earned him the Players’ Player of the Year, the Manager’s Player of the Year and the Supporters’ Player of the Year awards. In addition, he participated in Jamie Vardy’s V9 Academy in early June 2018. The 20-year old signed a two-year contract with Macclesfield Town in June 2018. Son of Clem Stephenson, who played for Aston Villa, Huddersfield and England and managed Huddersfield Town, Alan spent the final month of the 1938-39 season on loan from Huddersfield Town. He was described as an asset to the team and scored a goal in the heavy defeat at Port Vale. There is no information recorded about this player who appeared in the first and the last matches of the 1901-02 season. When Jimmy left school in Scotland he began work as an engineer completing his apprenticeship after signing for Second Division Third Lanark. At the age of 21 he had moved south of the Border signing for English Second Division South Shields in 1926 making 54 league appearances scoring 24 goals. Transferred to Bradford City in 1929, this move did not work out for him and he signed for Southern League Aldershot before moving to Stockport County in 1932. Here he scored 43 goals in 110 appearances in all competitions. In 1935 serious ligament problems brought his playing career to an end. Jimmy became Macclesfield’s first ever player/manager being paid £3.10s (£3.50) per week for his work including, supervision of training, skipping, running, walking, ball control and heading practice. He remained manager for a single season turning out for the team from time to time. He then returned to Stockport where he was reserve team trainer and remained there in various capacities for another 35 years. First manger appointed following WW2 and of the newly formed Macclesfield Town Football Club Limited. Evidently never sought the position and accepted only after strong persuasion by the Board of Directors. Prior to the War, a Selection Committee was responsible for the signing of players and team selection. On his appointment Stevenson was given the choice of sole responsibility for signing players and team selection or whether he would like these responsibilities to be jointly carried out by him and the selection Committee. He opted for the latter. This arrangement never worked as the committee consisted of a large number of members with diverse views and with the team standing next to the bottom of the Cheshire League at the end of November 1946, the Board decided to seek the appointment of a player/manager with sole responsibility for the team. It would seem that Stevenson stepped down as manager at this time as former player Chester Twemlow (see separate profile) was appointed as coach until the new manager was appointed. Born in Leith, Scotland Willie commenced his career in the youth section at Edina Hearts before moving to Dalkeith Thistle. In 1958 he was signed by Rangers where he remained until 1962 (106 appearances and one goal in all competitions). Bill Shankly then paid £20,000 for him when he moved to Liverpool in October 1962 where he went on to make 241 appearances scoring 18 goals in five years. At Liverpool he was described as an elegant left-half with an impressive range of passing ability and established himself as a member of the famous Anfield half-back line with Gordon Milne and Ron Yeats. In his first four seasons at Anfield he only missed nine league games, playing a key role in the championship wins of 1964 and 1966 and in the team which won the FA Cup in 1965 for the first time. In December 1967 he moved to Stoke City for a fee of £30,000 (111 appearances and seven goals in all competitions) where he remained until the end of the 1972-73 season having also spent a short time on loan at Hellenic in 1971. For the 1973-74 season he played for Tranmere Rovers (27 appearances in all competitions). In 1974 he spent a short time at Limerick before moving to Canada Playing for the Vancouver Whitecaps in the newly formed North American Soccer League. On returning to England he was player/manager for part of his single season at the Moss Rose. When he retired from playing football he became the landlord of The King’s Head in Chestergate Macclesfield and later ran a contract cleaning business, also in Macclesfield..
Dave was signed from Stalybridge Celtic having previously played for Bramhall, Droylsden and Witton Albion. A fringe player, who only made a limited number of appearances. On leaving Macclesfield he moved to Congleton Town. George played for Chesterton, the Leicester Regiment (twice) and West Bromwich Albion (Central League side) before joining Port Vale in the summer of 1929. He made six league appearances and scored four goals including two against Wrexham in January 1930 but was not selected again, although he remained at Port Vale until the end of the 1930-31 season. Signed for Macclesfield in the summer of 1931, initially George played as a forward, scoring on his debut and putting five past Crewe Alexandra Reserves in the 6-3 home victory in September 1931. In October 1931 he moved to the defensive line where he remained, other than for the occasional match when he returned to the forward line, for the rest of his time at the Moss Rose, filling more than one of these positions, although during the 1932-33 season he spent most of his time at left-back. He won Cheshire League Championship medals in both the 1931-32 and 1932-33 campaigns and gained a winners' medal in the Challenge Cup competition in 1931-32. In addition, he represented the Cheshire League side against the Welsh National League. Given a free transfer to Stalybridge Celtic at the end of September 1934 much to the disappointment of the supporters. There is no information recorded about this player who only featured in the first two matches of the season. Born in Rowlans Gill, County Durham, Jim commenced his career with Spen Black and White and then signed as an amateur for Newcastle United in 1948, later turning professional with them. He made many appearances in their Central League side before joining Exeter City in 1953 where he made nine senior league appearances. Signed for Bournemouth & Boscombe Athletic in 1954 but could not break into the senior side, and moved to Rochdale in 1955 where he made 38 first-team appearances. He spent the 1957-58 season at Darlington. He signed for Macclesfield in the summer of 1958 and appeared fairly regularly throughout the 1958-59 season although he was faced with competition for both the left and right-back positions. Said to have been a ‘sound’ player. Initially played for Percy Main and Chilton Colliery before signing for Monkton Athletic (January 1926) and then Barnsley (November 1926), Bedlington United, Rochdale (July 1928), Bradford City (summer 1931), and Hull City (May 1932). Signed for Macclesfield in September 1933 he was almost ever-present from late September 1933 to the end of the season scoring a goal in every four matches, including scoring in three consecutive matches in December 1933. His goal in Cup competitions came in his second appearance for the Silkmen in the 3-0 home win against Colwyn Bay in the FA Cup. On leaving the Moss Rose moved to Frickley Colliery in the summer of 1934. Signed from fellow Lancashire Combination side Hindley Central, Stott only made four consecutive appearances for the Combination team and a single appearance at the beginning of March for the Manchester League side. On leaving Macclesfield signed for Cammell Laird. The majority of his appearances came in the 1947-48 season, and even then he did not appear regularly in the side until the closing matches when he played in the Challenge Cup Semi-final and the Challenge Cup Final and the Final replay gaining a winners' medal. Described as a reliable and steady player. A member of the Macclesfield Youth Team. His one appearance came in the Cheshire Senior Cup when the youth team were fielded for the second round tie. Released at the end of the 2012-13 season. Signed from Ellesmere Port in October 1962 having previously played for Bolton Wanderers. In his relatively few appearances he scored a goal in every other league match. On leaving Macclesfield moved to Sankeys. A former Wigan Athletic trainee who represented England at schoolboy and youth level, Greg moved to Bolton Wanderers in September 1995 and then played for seven other clubs before joining Boston United in March 2004 who loaned him to the Silkmen in December 2004. He featured on the left side of a three-man central defence at a time when regular defenders were unavailable due to injury. On his return to Boston United, he was released and signed for Livingstone, subsequently playing for Dundee, Halifax Town and signed for Northwich Victoria in July 2007. Greg was manager of League of Wales side Rhyl from 2008 to 2015 leaving them in the summer of 2015 by mutual consent. Is now the Chief Scout at Plymouth Argyle. Signed from Didsbury, Stubberts filled the outside-right position from October 1909 to the middle of February 1910 when Brogden took his place. Stubberts is another player who scored on his debut. Just one appearance identified for this player for whom there is no information recorded. Said to be from Kidsgrove, Stubbs was a member of the Macclesfield reserve side. He made a single senior appearance in each of the three years he was connected with the club. Started his career in the youth system at Hednesford Town in 2006 spending time on loan at Bromsgrove Rovers. He then joined Grantham Town in 2008 but after four months signed for Coalville in February 2009 making a further move in July 2009 to Shepshed Dynamo. Signing for Chasetown in October 2009 he scored 13 goals in 15 appearances earning him a move to Forest Green Rovers in January 2009 where he made over 100 appearances scoring 34 goals. Unfortunately, whilst he was at Forest Green Rovers he suffered two serious injuries leaving him sidelined for many months. On recovering from his second injury he returned to action in October 2013 but was sent on loan to Wycombe Wanderers for the second half of the 2013-14 season at the end of which he was released by Forest Green Rovers. Reece signed a two year contract with Kidderminster Harriers in the summer of 2014 and whilst there spent two periods on loan at Tamworth. Signed a short term loan with Macclesfield in October 2015. Made just three appearances from the substitutes' bench, all of which came towards the end of each match. His last appearance came on 14 November at Woking, although he was an unused substitute in one subsequent match, however, he was unable to establish himself in the team as there were times when he was out of contention through injury and returned to Kidderminster Harriers in January 2016 at the end of his loan. Having been released by Kidderminster signed for Macclesfield featuring in the majority of the matches from the end of January 2016 to the end of the season making some lively performances. His four goals came in consecutive matches at the end of March: a hat-trick in the 3-0 win at Gateshead and the winning strike in the 2-1 home win against Grimsby Town. Although offered a new contract with Macclesfield Town, Reece opted to signed for fellow National League side Gateshead during the summer of 2016 but was loaned out to Nuneaton Town in November 2016. In January 2017 Reece was recalled early from his loan when his contract with Gateshead was cancelled by mutual agreement allowing him to sign for Tamworth. Made the move to Darlington in November 2017. Won the Marathonbet #NonLeagueChallenge for 2018 for the best goal celebration in Non-League earning his club a prize of £20,000 and a match against a legends side. Having announced that he would be leaving Darlington, a move initiated by the fan owned club, Reece moved to Alfreton Town in October 2018 for an undisclosed fee. At international level has made one appearance for England C and four appearances for Gibraltar - Faroe Islands, Estonia, Lichtenstein (an historic win for Gibraltar) and Macedonia. An amateur player who was drafted into a depleted senior side along with two other amateurs enjoying a 3-0 victory. Joined the Plymouth Argyle Centre of Excellence at the age of 10 in 1998 progressing through the ranks to sign his first professional contract in August 2005 and went on to make 91 appearances in all competitions scoring six goals. During his time at Plymouth he spent time on loan at Bournemouth (2007) and Leyton Orient (2009). Had a trial at Shrewsbury Town in July 2011 but was not offered a contract and signed for Cheltenham Town (51 appearances, six goals). Having rejected a further contract at Cheltenham he signed for Shrewsbury Town in July 2012 (70 appearances, four goals) and on his release in the summer of 2014 moved to York City (69 appearances, 12 goals). He left York in the summer of 2016 having rejected a new contract signing for Grimsby Town where he has made 27 appearances and scored two goals. Signed on loan by Macclesfield Town on 6 February 2017 to the end of the 2016-17 season with an option of a permanent deal should the Silkmen achieve promotion at the end of the season. Ever-present in the side during his time at the Moss Rose playing in the centre of midfield, Luke scored two spectacular goals, both from 35 yards, one of which was a free-kick, in the fourth round FA Trophy match at Dulwich Hamlet. At the end of his loan returned to Grimsby Town. Having initially been offered terms for the 2018-19 season, at the end of June 2018 they were withdrawn for no specific reason resulting in Luke being released by Grimsby Town and later signing for Wrexham. Photograph from National League web site. All of Billy’s appearances came in the first five matches of his single season at the Moss Rose. Commenced his career in the youth section of Oldham Athletic signing his first professional contract with them in 2012 making 11 senior appearances in all competitions in the 2012-13 season. Also spent time on loan at Barrow before being released by Oldham in January 2014. He was then at Birmingham City for a while before signing for Ashton United in the summer of 2015 but was released by them in November 2015. Signed a short-term contract with Macclesfield in December 2015. With the experienced Chris Holroyd holding down the right wing position, it was almost impossible for Sutherland to break into the team but on the occasions he replaced Holroyd he showed pace and determination. During the 2016-17 season Chris faced strong competition for the wing positions and was unable to force his way into the team resulting in him spending time on loan at Hyde United for much of the second half of the season. Out of contract at Macclesfield, Chris signed permanently for Hyde United in the summer of 2017. An occasional player during Macclesfield's first season as members of a competitive league. He scored a hat-trick in the 7-0 home win against Wrexham in the last league match of the season. Possibly a member of the Macclesfield Reserve side who was brought into the senior side for the final match of the season. An amateur goalkeeper from Ball Haye Green (Leek) who was one of three 'keepers used at the beginning of the season when Jack Hacking was unavailable. Born in Rochdale he spent three seasons with them and after his National service he played for Darwen and Rossendale. At 6’ 1” tall, weighing almost 15 stone he was nevertheless an agile ‘keeper. Brian broke his hand during his third appearance in the match at Chester and was out of contention until the middle of October. On his return he played regularly, but in the second half of the season he only appeared occasionally when he faced competition from other goalkeepers. Signed for the 1903-04 season, Sutton was the first choice right-half throughout his first season and until the middle of January 1905 when he may well have left the club. Stuart signed from Stoke City as goalkeeping cover. He played in the 3-1 defeat at Boston and was the ‘keeper in Sammy McIlroy’s first match in charge at Bath City in August 1993 which the Silkmen lost 5-1. Prior to joining the Silkmen Danny had only played for Bury where he made almost 200 appearances in all competitions. His move in January 2005 for a club record fee of £40,000 enabled him to link up with Dave Morley strengthening the central defence which resulted in a run of eight consecutive matches without defeat. In his time at the Moss Rose, Danny missed very few matches and was equally at home in a back four line or in a three-man central defence. He is a tall, powerful and reliable player who put his skills to good use in both defence and attack. In the absence of skipper Dave Morley he took over the captain’s arm band. Danny was another player who decided to accept the offer of a place in the MK Dons squad, moving there in August 2007. After loan spells at Northampton Town and Stockport County, he signed permanently for County in the summer of 2010 and was released at the end of the 2010-11 season after which it would appear that he retired from playing professional football. Bolton born Danny has since played for local clubs; firstly Eagley FC as player/coach moving to play for CMB FC in 2016 and in October 2017 joined Daisy Hill as player/coach. From the age of 15 played for junior clubs in Birmingham signing for Bournbrook in the Birmingham Combination at the start of the 1912-13 season. However, he only remained there for three months moving to Wolverhampton Wanderers although there is no record of him making any senior appearances for the club. He signed for Darlaston FC in the Birmingham and District League for the 1914-15 season and remained there until hostilities meant that league football halted. In World War One he enlisted with the RAF but after a short period of service was discharged. He then only played in a few charity matches. He moved to Manchester and had a month's trial with Manchester United after which he signed for Macclesfield in December 1919. Throughout the one and half seasons he spent at Macclesfield he had a good goal scoring record and was known for his solo runs, but he did not establish himself in the team during the 1920-21 season having to share the inside-right position with Percy Adams and James Morris. His most notable goal was the winning strike in extra time in the final of the Altrincham Cup on 1 May 1920. He also held a junior international (reserve) medal for a Birmingham v Scotland match and a Wednesbury Cup winners' medal. He left Macclesfield at the end of the 1920-21 season and played for Whitchurch in the 1924-25 season. Note: It is believed that the correct spelling of his surname is Swain, however he is often referred to as Swaine in match reports. Before signing for Macclesfield had played for Runcorn, Bangor City and Rhyl. A robust defender, Sammy started and ended the season as the first choice for the right-half position. However, in the middle of the season following a loss of form, he had to compete with Jesse Thornley and George Stockton. He was reinstated in the middle of Ferbruary in time to help the side win the Cheshire Senior Cup in 1935 and gain himself a winners' medal. On leaving Macclesfield he signed for Ashton National. Jeff signed from Southport, his previous clubs having included Skelmersdale and Northwich Victoria. Cousin of Webster Swift and previously with Bury, he made a single appearance for the Silkmen when he deputised for Jack Roscoe. Joel signed for Altrincham in the summer of 2014 where he has become one of the longest serving members of the reserve team. Started his career at Wombwell before signing for Halifax Town in May 1927 remaining there for the 1927-28 season. Thought to have been with Macclesfield during the 1928-29 season but did not appear for the senior side, nor has any mention of him playing for the reserves been found. Next with Crewe Alexandra Reserves (July 1929), a return to Wombwell (August 1930) and Stockport County (May 1931). Signed for Macclesfield in October 1932 he was described as one of the team's most competent players featuring regularly from his debut through to the end of December 1934 when he was injured. He returned at the end of January but was injured again and only made one further appearance, but by then Harry Bruce had been signed and had become the first-choice centre-back. Nevertheless, Webster served the side well and gained a Cheshire League Champions medal for the 1932-33 season. On leaving the Moss Rose he moved to Hyde in summer 1934, then Frickley Colliery (summer 1935) and Denaby United (August 1936). He was a school teacher and held a BA degree. Acted as goalkeeper for the Macclesfield reserve team over two seasons. His appearances at senior level came when he deputised for John Wilkinson when Wilkinson was unable to play due to business commitments. Played for New Mills during the 1908-09 season and was brought in at Macclesfield to deputise for Wilcocks, who was unavailable because of a sprained knee, for one match in the Lancashire Combination team. In the 1922-23 he was a member of the Macclesfield reserve team and again found himself in a deputising role in the league match against Crewe Alexandra Reserves in September 1922, on this occasion for Fred Joynt who had been injured in the previous match and also featured in the final match of the season. Initially played for Buxton Road Congs (Stockport) and Witton Albion and then commenced his professional career at Crewe Alexandra in the summer of 1927 where he was twice top scorer. Whilst at Crewe he scored 126 League goals which at that time was a club record. He then moved to Chesterfield Reserves (June 1937), Barrow (November 1937) Bradford City (July 1938), Hyde United and Hurst (summer 1939). Signed for Macclesfield in the summer of 1946 as a player where he was joint top-scorer in the 1946-47 season alongside Billy Lomax and Harry Ryan. He was the club’s reserve team manager before taking over as manager in May 1949. Bert led the side to the Cheshire Senior Cup final in 1950 (losing to Northwich Victoria) and the Cheshire League Cup Final in 1951 (losing to Altrincham) but they went one better winning the Cheshire Senior Cup in 1951 when they beat Northwich Victoria 3-2. He resigned as manager in October 1951. He also had a second spell as manager from November 1955 to the end of the 1957-58 season. An amateur player at Huddersfield brought to Macclesfield by vice-captain Norman Christie. Sykes was unfortunate in his one and only match for the Silkmen as he sustained a fractured shin bone after only 25 minutes of the first half. The 6’3” tall striker is a former Everton trainee although he never made a first team appearance for them. After a short loan spell at Crewe Alexandra, Michael signed for Bradford City in the summer of 2004 where he only made a few appearances, was loaned to Stockport County in January 2006 and then Shrewsbury Town before signing for Shrewsbury permanently in the summer of 2006. In 68 appearances in all competitions he scored 16 goals for Shrewsbury, but after struggling to claim a regular spot at the New Meadow he signed for the Silkmen on loan until the end of the 2007-08 season. He featured regularly in his first two months at the club scoring just one goal, a brilliant 35-yard volley in the draw at MK Dons, but in the final matches of the season he was only used as a substitute. It was Michael’s second spell at the Moss Rose, his first cut short by injury before he had a chance to make an appearance. He returned to Shrewsbury at the end of the 2007-08 season. He later played for Accrington Stanley and AFC Bournemouth from where he went on loan to Rochdale. Michael signed for Leyton Orient in the summer of 2012 and whilst there spent time on loan at Burton Albion signing for them permanently in the summer of 2013. Moved to Southport in the summer of 2014 leaving them at the end of the 2014-15 season. Yorkshire born of Hungarian parents, Tibor was signed from Bradford City. He was a skilful ball player who was particularly good in the air. Scoring almost a goal every two matches, Tibor notched up a hat-trick in the 7-1 away win at New Brighton in the FA Cup Preliminary Round, and scored two goals in each of the winning NPL matches against Runcorn, Witton Albion and Worksop Town. On leaving Macclesfield he signed for Mossley (three times), Gainsborough Trinity, Goole Town, Morecambe, Buxton, Accrington Stanley, Atherton Laburnum Rovers, Harrogate Railway Athletic, Ossett Albion, Ossett Town, Liversedge, Eccleshill United and lastly as a player at East Bowling Unity. Having retired from playing he acted as coach at Bolton Wanderers, Burnley, Leeds United, Bradford City and Halifax Town's academies and centres of excellence and in the USA. Also, when Mark Brier formed Soccer Elite in 2000 he also formed the Vision Coaching Academy with Bradford-based coach Tibor Szabo.